18. Global Climate Change and U.S. This book is a wonderful combination of the imagery and science.At one level, it could be a fascinating book about the wonders of scientific research, while at another it could be a collection of wonderful photography from scientists around the world.Seamlessly combining these two fronts, while elucidating the truth about climate change in a very real and striking way, "Climate Change: Picturing the Science" allows its readers to literally see what is happening to our world and those who are searching for a cure. For what it aims to do, this book is excellent.The authors aim at a basic but accurate introduction to anthropogenic global warming (AGW)in an accessible and attractive format.Included are not only the basics of AGW per se but also discussion of how the different forms of climate science are done, the consilient evidence, and a brief but useful introduction to policy issues.There are many stunning photographs and the text sections are clear and concise. An amazing amount of detailed but coherent information in one place. It also really lets you know that even this collection is just the tip of the (melting) ice berg of evidence and knowledge. It's not 'dumbed down' either which I appreciated. Unfortunately this stuff can't be dumbed down enough to be intelligible to the wacko 'deniers', and if it WAS dumbed down that much it wouldn't be convincing. This isn't a problem with the book, but does underscore the intractable problem: NO book no matter how good can make the case to people who aren't willing (or are unable) to pay attention. This pictorial does little to enlighten the debate over the role of anthropogenic carbon in climate change. 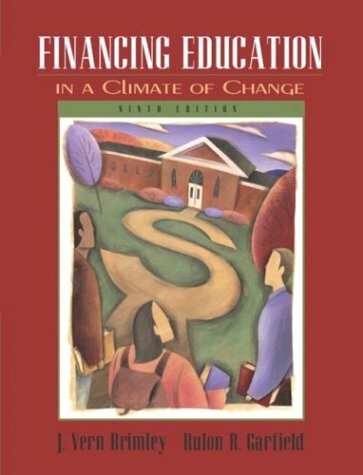 <>This classic text on school finance contains the most comprehensive and current information that affects school finance, including historical, economic, technological/mathematical, and legal points of view. 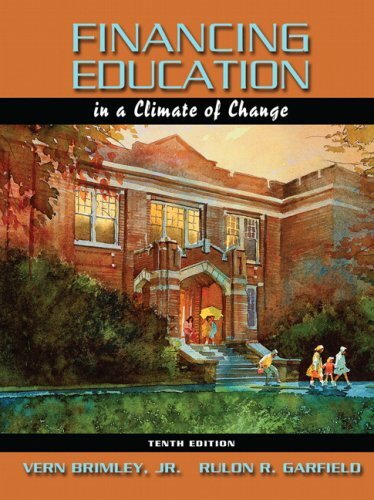 This book is both scholarly and engaging, and is practical, easy-to-read and comprehend; appealing to a diverse audience of students, educational leaders, parents, and legislators. School finance is an evolving topic and this text, now in its Tenth Edition, continues to cover all current trends to provide readers with a firm knowledge of educational finance trends and issues that administrators need to understand. It serves as an excellent reference for both practitioners and academics. I ordered my book on January 13, 2010 and paid for it through Amazon.com. To-date, I have not received my purchased book. Amazon.com claims I should have received my book by now. I have contacted Amazon.com and the sender with no concrete results or answers. All I received was a Refund policy which stated the conditions of how Amazon.com will not refund my money. In three years Amazon.com has always been very reliable and now my heart is broken and my course work is suffering greatly. I can not reach customer service only email them with no great responses to my requests. I need thema to contact my professor at least. Today is February 14, 2010. Still not book. Now I am out of $105.99. In this economy, who can offer this. So far this has been an easy read book and everything that I have been assigned to read and respond on has been in this book!Great Job! This book is informative, easy to read and user-friendly. The arrangement of the text on the pages makes it easy to read section by section. There are no wasted words in this book, so there is no wasted time reading. It's a great resource for future use. I'm definitely keeping mine. I received the book quickly, sooner than I expected.I was told the book was new, even wrapped like new.When I got to chapter 3, the beginning was highlighted.Only 1 page of highlighting, but certainly not new.All in all the book is in good shape, but if it's used, list it as used. In addition to being a textbook, this is a resource worth adding to your professional library. This book was just what I needed for my class.It had all the info that I needed to help me succeed in the class. Although global in scale, the impact of climate change will be felt at the local level. 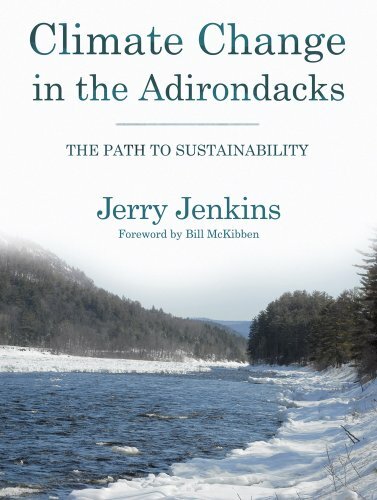 Refocusing our attention away from the ice shelves disintegrating in the Antarctic, the flooding of Pacific islands, and carbon inventories measured in billions of tons, Jerry Jenkins turns to changes that are already occurring much closer to home, changes that threaten to transform one of America's great wildernesses, the Adirondack region, into a damaged and unfamiliar landscape. Hulme's book asks an important question regarding our understanding of 'climate change,' namely: how do different cultures, religions, and histories come to regard the subject in such multifarious ways? Philologically, it is important to understand the histories of words like 'nature,' 'natural,' 'society,' and 'culture' before understanding how these histories came to shape our current ideas re: the science and inform policy decisions. Moreover, disparities in opinion must understand culture ethics, religion, prioritization of outcomes (in this issue and others), and economization, among other data. Climate change will not act as an issue to be solved, but rather, will serve as an impetus to reassess our place in the world and the prioritzation of issues. This book is a must read regardless of your side on this debate, and highly recommended for healthy skeptics and those with a genuine interest in the climate change controversy and related policymaking. Not surprisingly the book was included in The Economist list of Best Books of 2009. Mike Hulme is a renowned climate scientistwith a 30 year experience in the field who works at the University of East Anglia, and even was Director at the now famous CRU (though he was not involved in the Climategate scandal). Considering his honest view on this subject and his openness in the discussion of such contentious issue, in order to avoid any misunderstandings, right at the beginning of the book Mr. Hulme makes explicit his position regarding climate change: he believes the risks posed by climate change are tangible and serious, and require human intervention and management, and also that the global climate is influenced by an array of human activities. However, he does not believe that the way the UN FCCC and the Kyoto protocol are neither the only nor the most appropriate way to attack this problem. Also he "feels uncomfortable that climate change is widely reported through the language of catastrophe and imminent peril, as `the greatest problem facing humanity', which seeks to trump all others." Mr. Hulme presents quite an innovative and insightful approach to the climate change discussion, by looking at it as a social phenomenon, as an "idea" interpreted differently by different cultures and by our different sets of believes, values, and concerns, and therefore, what it means to different people in different places. 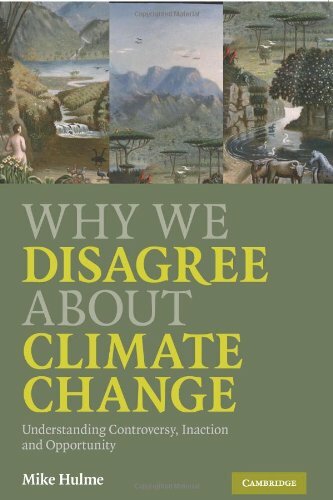 He explores the different dimensions of this "idea" in several political, economical, cultural and ethical contexts, and by identifying the different meanings of climate change he argues we can better understand why we disagree about climate change. Some of these meanings include climate change as a justification to fight globalization, as a desire to return to simpler times, while for others is a great opportunity to develop to technologies that will solve the problem, the desire of pride and control. He summarizes these views to what he calls four myths: Eden, Apocalypses, Babel, and Jubilee. Simply brilliant! He also looks at climate change as a wicked problem, and presents a very insightful analysis of the possibilities of elegant and clumsy solutions. Despite the strong sociological and philosophical discourse, Mr. Hulme makes a very strong case for his view of the problem, and his main argument has been confirmed by two recent events, Climategate and the failure of the Copenhagen meeting. On a second thought, I think this book is also recommended for hard-die global warming advocates, so they can begin to understand why their cause is beginning to erode, and it is not because the science is a hoax, as the deniers camp has declared recently in light of Climategate. For more on Hulme's approach to climate change as a wicked problem read Clumsy Solutions for a Complex World: Governance, Politics and Plural Perceptions (Global Issues), which tackles other wicked problems of social nature. Academic, but a must read! PS: Some critics have said that Hulme's ideas are naive. Well, if you are in doubt, read the Hartwell Paper published in May 2010 (available for free in pdf format in the web, just google). In this publication Hulme and another 13 academics and energy advocates argued that the Kyoto Protocol has failed to produce any discernable real world reductions in emissions of greenhouse gases in fifteen years, and therefore, after the Copenhagen fiasco, Kyoto has crashed. They argued that this failure opens an opportunity to set climate policy free from Kyoto and they propose a controversial and piecemeal approach to decarbonization of the global economy which will be more pluralistic and much more effective than the policies based on Kyoto. The Hartwell paper strategic approach is partially based on Holme's book regarding wicked problems and clumsy solutions, as well as taken proper consideration of the different views and interpretations of climate change around the world. There is now one more reason to read Why We Disagree About Climate Change. Do not miss it. Too much social discourse is directed at magnifying disagreement and disparaging the motives and intellect of others (for more evidence on this point read the disagreeable review by Joseph Bast).In this fine book, Mike Hulme takes the position that reasonable people can and do disagree; he then sets off to examine the disagreements and the reasons. Hulme explores numerous areas of disagreement and organizes his chapters around specific areas.He begins with three mostly (though not entirely) science-oriented sources of disagreement, which involve our conceptualization of climates and climate change, the development of scientific thought regarding climate change, and what science can and cannot tell us.From there, he moves onto disagreements regarding economics, religion, fears, communication strategies, development, and government action.The book ends with a provocative chapter about rethinking climate change. My own nerdy biases initially drew me into the first chapters, especially the history of scientific thought regarding climate change.Hulme points out that scientific acceptance of the notion that climates change is relatively recent, dating only to the 19th century.Widespread scientific acceptance of the theory of anthropogenic climate change on human time scales is newer still.Although components of the theory, such as the greenhouse effect, were developed in the late 19th and early 20th centuries, it wasn't until the last quarter of the century that broad elements of the scientific began to broadly accept anthropogenic global warming. However, accepting the likelihood of anthropogenic global warming is only a scientific preliminary.For effective public policy, we need to know much more, including how strong the link between human activities and climate change is, when and how fast systemic changes are likely to occur, how the effects will be distributed, and what the possibilities are for catastrophic changes.As we move into these important areas, the scientific disagreements become larger, and the opportunities for other sources of disagreement to influence scientific discourse also grow. At a first reading, I was initially disappointed with most of the follow-on, non-scientific "disagreement" chapters.The chapters work well enough in listing and explaining many ways that people can disagree about things.However, they do not explain which disagreements really matter and whether there are fundamental and connecting sources to the disagreements.There are interesting arguments and insights along the way, but much of the material reads like a middle-of-the-road undergraduate term paper--"it could be this (source A), it could be that (source B)," and so on. Different readers will nonetheless appreciate different things in these chapters.As an economist, I enjoyed an outsider's take on my profession's disagreements.The discussion of development challenges was also very good, especially in reminding us of how many times smart, careful, and concerned people from Malthus to the Club of Rome have predicted doom only to discover that humans have innovated, adapted, and prospered within the then-existing environmental constraints. The deeper rationale behind these chapters, though, became clearer after reading the final chapter.A central point of that chapter and ultimately of the book is that climate change is here, and the notion of climate change can't be undone.Climate has changed and will change, and humans, to some extent, are affecting this change.Once we accept this, we cannot "unknow" anthropogenic climate change. Another crucial point in the chapter is that we are unlikely to "solve" the climate change "problem" in any conventional sense in our lifetimes. "Solving a problem" implies meeting a particular objective; in the case, of climate change, what would that be?Suppose that science could give us the magic key to setting the planet's climate--where would we set it?Do we want a pre-industrial climate, a 20th century climate, something warmer, something cooler.Also, (and this is the part where the non-science chapters come in) which objectives do we adopt? Hulme instead advocates for the more sensible position of living with climate change.To be clear, he does not mean this in a fatalistic sense or as a call for a "do nothing approach. "Hulme does mean that we must accept that human activities affect the global climate and that those activities have consequences that impede other objectives.He reminds us that our behavior and policy setting should focus on those objectives rather than the fact of climate change. Professor Hulme has a disturbing view on the topic. Very interesting especially due to the monochordial point of view of most of the press. He challenges the accepted courses of action. I definitely recommend. What if CO2 emissions from 6,000 older inefficient PCs in Duluth could be reduced by half by replacing them with one big 5-acre computer in Des Moines run by just 88 people? Think of what we'd save in CO2 emissions! We'll establish another UN bureaucracy with green jobbers to monitor this mitigation plan! And we'll finance it all - and a make a ton of money - with an annual fee per ton of CO2 emissions saved - paid by New Yorkers required by law to pony up - every year for the life of the computer in Des Moines, estimated at 20 years. We'll charge fees for any files printed in Des Moines and delivered to Duluth (but ignore the CO2 emissions generated in transit). Along with the Teamsters, NGOs and bureaucrats, New Yorkers will be thrilled by this plan since these are green jobs and, after all, we're saving the planet! Global momentum is building to reduce greenhouse gas emissions. So far, so good. The less happy news is that Earth's temperatures will continue to rise for decades. And evidence shows that climbing temperatures are already having serious consequences for vulnerable people and regions through droughts, extreme weather, and melting glaciers. 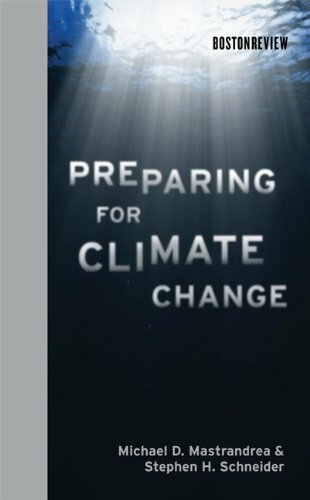 In this book, climate experts Michael Mastrandrea and Stephen Schneider argue that we need to start adapting to climate change, now. They write that these efforts should focus primarily on identifying the places and people most at risk and taking anticipatory action—from developing drought-resistant crops to building sea walls. The authors roundly reject the idea that reactive, unplanned adaptation will solve our problems—that species will migrate northward as climates warm, and farmers will shift to new crops and more hospitable locations. And they are highly critical of "geoengineering" schemes that are designed to cool the planet by such methods as injecting iron into oceans or exploding volcanoes. A clear, concise rendering of the 2007 IPCC report for non-climatologists written at a university entrance level. The authors take us through the scientific methods behind the IPCC report. Concepts are explained clearly without journalistic embellishment but with a degree of readibility sometimes lacking in the actual IPCC document it explains and is based on. Imparts the appropriate sense of urgency to the looming catastrophe that is likely without prompt action, but avoids notes of despair while pointing out the roadmap for action. Ideal reading for an entry level understanding of this important topic. The textbook of record for Climate Change 101. This is exactly the book I was looking for.The scientific details are provided and explanations are clear.Even more importantly, the writers are honest about what the current state of climate science can and cannot tell us.The conclusion is inescapable, global climate change is occuring and humans are the cause.How can there possibly be any doubters left? The authors have attempted to summarize and assess the scientific literature that has been amassed since the late 1970s. In their account, they backtrack to provide a perspective based on What We Knew and When We Knew It. They are eager to investigate charges that led up to the present time. Reflecting on the issues of the polar ice sheets and permafrost areas of the world, they address popular opinion as well as opinion shifts. Next, they examine the impact of climate change on the oceans and weather. Looking at the past, they hold out hope for the future, suggesting ways in which nature may cope with climatic change. Finally, we are led into the delicate balance of energy consumption and the effect of greenhouse gas produced by fossil fuels. The authors conclude with concern over world climate policy and whether it will result in conflict or unprecedented global cooperation. A vital read. 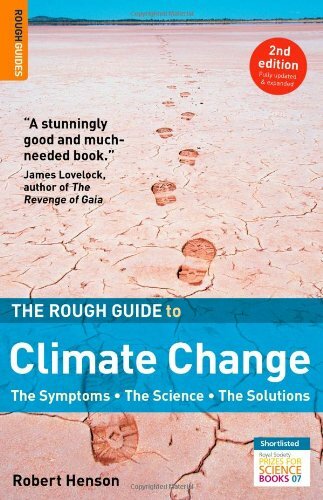 The IPCC AR4 report too technical for you?Want to learn about the climate change?Then this is a good book for you. 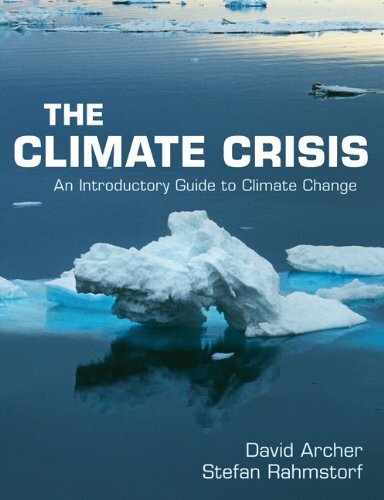 "The Climate Crisis: An Introductory Guide to Climate Change" by climatologists David Archer and Stefan Rahmstorf was published this year and does a decent job of explaining the status of climate science to non-scientists. That doesn't mean the book isn't technical. It is chock full of color graphics, charts, tables, and photographs documenting every aspect of climate science.But the authors work hard to present the information in language that educated non-scientists and scientists and professionals in other fields can more readily understand.Overall they accomplish this goal, though I do think that parts of the book are still technical enough to confuse your "average Joe. "Conversely, I don't think they explain some of the charts well enough - there is a tendency to have a narrative and reference a chart or graph, but then not explain the graph in detail.This is intentional as the book is designed to communicate the information on a level that non-climatologists can understand, but I did find myself wanting to drill into the figures more than was enabled. Still, these are minor quibbles and I find the book to be a very useful addition to the reading list of anyone interested in the topic of global warming or climate change.The authors are both practicing climatologists and professors of climate science. Rahmstorf was one of the lead authors in the most recent IPCC Fourth Assessment Report (called AR4).Both contribute to the RealClimate.org blog on the topic. The book itself focuses on the state of the science and looks at what evidence of climate change we have already seen, what is happening with snow and ice in various parts of the world, how the oceans are changing, and how climate is measured.They also have chapters on what we might see in the future with respect to climate change, impacts of those changes, and how we can avoid the worst of it.They briefly touch on climate policy in the last chapter, but they focus on the need for action, the global nature of the cooperation required, and the differences between developed and developing nations, rather than discussing any specific policy solution. I definitely recommend the book.Readers will find it both informative and enlightening. changes because of the human influences on the atmosphere. Impacts of climate change, Avoiding climate change and climate policy. basics - you will be glad you did! The vast majority of scientists agree that human activity has significantly increased greenhouse gases in the atmosphere—most dramatically since the 1970s. In February 2007 the Intergovernmental Panel on Climate Change found that global warming is "unequivocal" and that human-produced carbon dioxide and other greenhouse gases are chiefly to blame, to a certainty of more than 90 percent. Yet global warming skeptics and ill-informed elected officials continue to dismiss this broad scientific consensus. In What We Know About Climate Change, MIT atmospheric scientist Kerry Emanuel outlines the basic science of global warming and how the current consensus has emerged. Although it is impossible to predict exactly when the most dramatic effects of global warming will be felt, he argues, we can be confident that we face real dangers. Emanuel, whose work was widely cited in media coverage of Hurricane Katrina, warns that global warming will contribute to an increase in the intensity and power of hurricanes and flooding and more rapidly advancing deserts. But just as our actions have created the looming crisis, so too might they avert it. Emanuel calls for urgent action to reduce greenhouse gases and criticizes the media for playing down the dangers of global warming (and, in search of "balance," quoting extremists who deny its existence). This very short book explains the science of climate in simple and concise terms so that nearly anyone can understand it.In doing so, the author explains the tremendous uncertainties involved and that certainy is in fact impossible due to chaos theory.This may be embraced by deniers who scoff at gw.But it may also go the other way...gw may in fact turn out to be far more dangerous than currently thought.The author alludes to the possibility of a "tipping point" where the climate could abruptly change at the end of ch5. Only one thing is certain- it is beyond human capacity to prevent disasters.We are only capable of reacting to them (and fingerpointing) after the fact.So if gw turns out to be a major problem, let's hope there's a quick and dirty tech fix. Unfortunately, Emanuel discusses very little of the controversy... the book needs another ch to address this, including the "infamous" hockey stick (which is the only figure in the entire book).More specifically, the author should refute some of the silly arguements against gw, and also acknowledge where there is genuine controversy.The afterword also doesn't fit with the rest of the book. Finally, the book is way too expensive given its length.In fact, as a public service, I think it should be a free e-book.Even so, it's definitely worth reading. Kerry Emanuel is one of the world's foremost experts on hurricanes, a professor of atmospheric science in the Department of Earth, Atmospheric, and Planetary Sciences at MIT. In this *excellent* little book he describes the basics of our scientific knowledge in the area of climate change, without succumbing to the temptation of presenting a heated polemic that so often accompanies this topic.Rather, he straightforwardly describes the science -- noting its complexity and not under- or over-stating its uncertainties.What's left is a truly informative look at the current state of our understanding and the firm belief that continued study will refine our knowledge. I was looking for a book that would explain to me how man made climate change works.This book didn't do that.There is no evidence or explanation offered for how the climate works or how man affects it in this book. This book asks you to have faith in the theory and just believe in it even when the author can offer no good reason to do so.If you are looking for a thin book filled with nothing more than propaganda this is your book but if you are looking for what is known about climate change find another book because this one fails to enlighten. This is better described as a long pamphlet rather than a book.It is a bit overpriced at $10. Still, it is a very good concise description of the science of climate change.Dr. Emmanuel does a good job outlining what we know and where the uncertainties lie.The subject is so complex that a more concise explanation is probably not possible. I recommend that everyone read this "pamphlet" to better understand the science behind the issue. 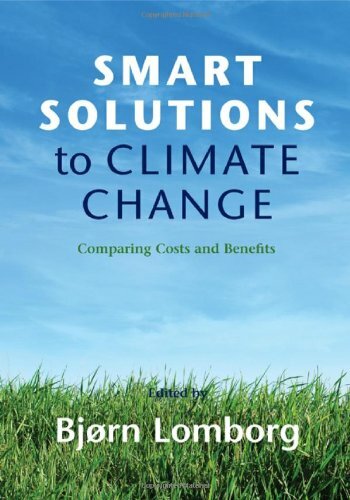 The afterword of the book attempts to sketch how the problem could be solved.The authors make the point that we can solve climate change without damaging our economy.I don't understand other reviewers' criticism that the afterword is somehow biased or unrealistic.It is just meant to be thumbnail sketch of ways to solve the problem not a detailed plan. 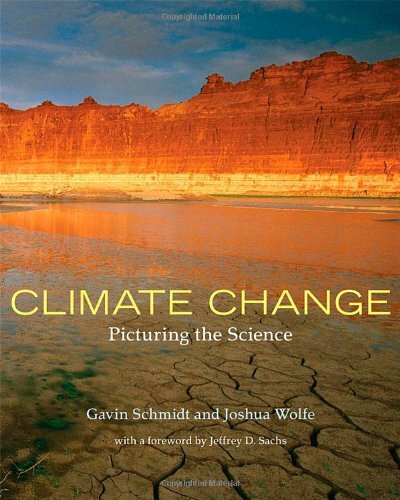 The book covers a lot of all the things related to Climate Change. But it's obvious which side the book's author is on, and I would wish that the discussion part would be expanded a lot more. It wasn't what I hoped, but still good to have, if you have to look up some of the things related to climate change. Mr. Henson's book makes for a rather dull speculative read. For all the so called facts and figures, most of his sources are from the same scientists and organizations responsible for the AGW fraud. My suggestion is, if you care about the environment, save a tree by not wasting your time buying this book. The table of contents indicates this book contains very little analysis of climate change over the last 3 million years.Historic climate change must be considered to determine whether climate change now is extraordinary in any way and could therefore be blamed on humans.Evidence worldwide as reported in many scientific reports shows alternating warm and cold periods during the earth's history.During the last two-and-a-half million years, about fifty cold and fifty warm periods have occurred, although only twenty-one of the cold periods are considered to have been major ones, which were separated by interglacial periods.During previous interglacials, ocean beaches as shown in rock layers were higher than the ocean levels today (suggesting higher temperatures and more glacier melting than today), and methane and carbon dioxide (greenhouse gases) levels in the atmosphere were higher than during the glacials.Rapid changes in temperature, known as climatic flickers, have occurred thousands of times during the last ninety thousand years and are included in longer-term climate changes.For example, the last major glacial included two relatively warm periods, one of which included a shift from glacial to interglacial temperatures in only five years.Average temperatures over Greenland during the last interglacial varied up to twelve degrees Centigrade.Many minor glaciations apparently lasted a very short time, followed by rapid warming of up to seven degrees Centigrade in only a few decades.Numerous lines of evidence suggest that temperatures during the Medieval Climate Optimum were higher than today. Studies of historic climate change thus show that the climate dynamics we see today are essentially the same as before humans. So, no evidence existing today appears to justify the conclusion that humans have caused significant or extraordinary global warming, and The Rough Guide is very deficient if it does not thoroughly summarize the available information on historic climate change. This book seems to have gained the status of being a go-to reference for those who are interested in global warming and one of the few books that global warming skeptics claim to have read, in many cases. This is understandable because the book is something akin to an encyclopedia of climate change. 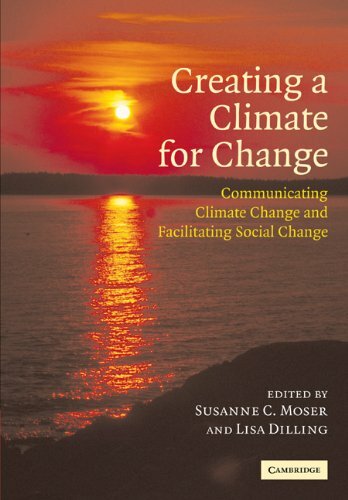 It has sections and chapters on almost every topic related to climate change, including some of the skeptical arguments and covers everything from the history of climate change to ideas about what can be done. It makes reference to a number of other books and famous researchers. A person could read just this book and have pretty decent overview of the issues involved. On the bad side, the layout of the book and its style cause a couple of problems. First of all, the book is full of sidebars and boxes with side stories and references to other pages in the book where you can read more on a topic. That would be great if you are paging through or just looking at one topic. However, if you hope to read it straight through like an average book, this format is terribly distracting and you find yourself stopping about every other page to read a sidebar and then continuing on. I suppose there is some reason for laying the book out this way, but not everyone will like it. I give the book only 4 stars based on this alone. The other issue I have with the book is that in some cases, the presentation of a topic is a bit too sketchy and glosses over some important issues or presents so many different points of view that some of them may not be completely compatible. - It's freezing outside--where's global warming now? - Climate is always changing--how do we know this isn't just a cycle? Climate change is happening at the earth's core. It's warming lakes and there are changes in the weather. The thing that stuck out to me is that weather is different than what is happening. Yes there are record colds but it's how much the seasons are changing that is being effected. They use charts, graphs, and other facts. They even debunk the myths that people like Al Gore are trying to prove. They take real life examples and show how things have changed around the world. It's not about politics. It's about the science of things. Looking back at temperature changes for hundreds of years. I was blown away by the detailed record keeping over the centuries. They wanted the straight facts not all the hot air that is blowing around about this topic. They laid it all out, what causes were happening both by nature and by man. We're causing the most problems. The main problem with most of it is that it is expensive to change how we live. Yes, recycling does help but that is only one thing that can be done. Yet we are creatures of comfort. I loved the honesty of the authors that laid it all out for you. They even admitted that they didn't agree on everything. Statements throughout the book just made my eyes open even more. I may not understand it all. I am still learning but definitely want to read more on the subject. The final thing that it left me with is something that I have always felt. I want to take care of the Earth that we do have. Yes there will be a new heaven and a new earth as it is stated in the Bible. I am concerned about what we have now.I also liked the fact that they gave you other sources to understand more of what is happening to our Earth. This is one book that will stick with me for a long time. If you like Elmer Gantry, you'll luv this "book." I applaud the energy of the authors and I really hate to rain on the parade but I have to do my best Paul Revere impression on this toxic book.If the system allowed, I would give it a zero rating. I found this little "gem" in our church library this morning bearing the label "new" and have spent the last two hours reading it.That was about 90 minutes more than this work deserves.I would like to think that the authors mean well, but I also wonder whether or not they have simply sought out and found their niche for making money off a trusting Christian community just as the Elmer Gantry types learned to do 70 years ago.It may not be all their fault because the Christian community in the past 25 years has embraced the commercialization of the faith, and maybe that's standard operating procedure in their environment.But if so, this is a perfect example of why it is a very bad idea and cheapens the faith. I will be blunt.This volume, in my opinion, is an intellectual, scientific and theological travesty--even if they are correct on the science, and in that I remain a sceptic due to the total lack of credibility of the science community. I am distressed that it found its way into our church library and that anyone would hold him or herself out as a Christian and publish such a lacking epistle intentionally to the Christian community.The authors would do well to read and study Alexander Pope's Essay on Criticism, you know, that one with the line "a little learning is a dangerous thing." Science has entered a period where it has become two ugly things at once: the grand Inquisitor where Truth is no longer its objective (money and conformity to the thinking of the money source have taken over as the goal) and where it has prostituted itself towards that objective.The search for Truth, Academic integrity and Academic freedom are relics of the past.It is all about money, and you do what it takes.And so, we start with what seems to be a bit of puffery in credentials.A little Google looking leads to the discovery that "Dr." Hayhoe is not a doctor of philosophy at all.Once you know that little fact, you then realize the unusual description of Hayhoe as a "climate scientist" with no mention of earned degrees. The book never states that she has a doctorate but the clear inference is there, and even some prior reviewers (and many news stories) have assumed such. According to Hayhoe's bio, she has a BA in physics and astronomy from University of Toronto and a masters degree in climate science studies from University of Illinois, no doctorate, and her position at Texas Tech is a "research associate professor", not the expert.The book itself has a bibliography of 38 pages, with a high percentage being web articles, and cites to only two of her own works, one a web-site URL on page 185 which appears to be a short report about climate in Chicago but the report is no longer available, the other on page 189, seemingly a similar report about California that looks to be five pages long. Hayhoe does get a lot of publicity but it does not seem she is in the category of a renowned leading expert. There in fact are many real PhD climatologists around the world who would disagree with most of the "science" she claims to describe, but you would never know from the volume that any such real scientists even exist, except perhaps in her repetitively opaque (but less than scientific) argument that "some would deny....but...."I do not find that to be an acceptable way to dismiss the opposition--at least have the guts to put a name to your Goliath and then take your best shot, but don't put the burden on the reader to say "Well, what about Prof So-And-So who thinks you're nuts." In that regard, Hayhoe claims over and over that the data is known and settled, yet the fact is that many of her scientific comrades were caught last year with their hands in the proverbial cookie jar of destroying and hiding data upon which their hypotheses rest, over a period of many years, claiming at the time that no back up data was preserved.Is Hayhoe claiming that she has a spare copy of the missing data?I doubt it, but she makes her claims nonetheless. Overall, as a description of the science and the issues, this book is exceedingly misleading as a supposedly fair presentation of the facts and issues.I found it incredible and sorely deficient that not one footnote is found in the entire book. The reader is at a loss to evaluate the claims other than by faith--they look so nice in their pictures, so it must be true--or at best the reader can go to the bibliography and guess what was relied upon.As for the issue of cause even in a period of warming, exceedingly simplistic discussion is provided considering that well respected real climatologists disagree strongly with the premise. The sophistication of writing and argument is not of high standard. Example:she starts with the anecdotal tear-jerker of the story of the Eskimo village of Kivalina. Fast forward to pages 19-20 and figure 7 re the Medieval Warming Period and what does she do but dismiss this rather dramatic climate period that first allowed colonization and when ended drove the Vikings out of Greenland and Labrador as a mere anecdotal event "only relevant to one particular region of the globe." I kid you not. Hayhoe hides what would be the most easily understood evidence of the actual temperatures at relevant periods--her graphs and charts never use actual temperatures. And, at page 145-146 she actually glosses over the very substantial risk of poisoning little children from the mercury contamination of the pretzel fluorescent bulbs that are to be used to replace the incandescent ones, arguing that the risk is no more than found in a mercury thermometer.Most homes have no mercury thermometer at all any more since technology has made them obsolete, but they have dozens of light bulbs. Perhaps she just doesn't realize that in essence she is saying that the sacrifice of a few kids a year is a price she is willing to pay to get rid of the tradional light bulb.She also cites, at page 84, to hurricane Katrina in her discussion of enhanced storm strengths--this is totally irresponsible, and I don't get it.Katrina was a Cat 3 storm that took aim at a state with an unqualified governor and a more unqualified mayor.QED. The authors also should have disclosed in the book the degree, if any, to which Hayhoe profits from the "scientific" views she espouses in this volume, both in her Texas Tech position and her private company (perhaps being paid to write papers that support the views of the grant issuers) considering from the description of her position at the university that her main endeavors relate to spreading the world according to Al Gore.The adage to Follow The Money applies.The question is rightfully asked.If the funding for her job comes from those who are content with and expect her to actively advocate her views, then the readers are entitled to know that. I was particularly offended by Hayhoe's Canadian whack at "stupid" Americans.She is a Canadian transplant, as am I, and I spotted her Canadianism on page 56 where she lectures the reader on the difference between weather and climate. To understand the slight, you need to know that there is a goodly sized segment of Canadians who will belittle Americans at any and every opportunity. She tells the same apocryphal story I heard 30 years ago of the dumb Americans who arrive in Canada in July with snow skis strapped to their cars, but in all my many years in Canada I never saw or spoke to any Canadian who actually saw such happen, and I don't believe it for a nanosecond. Canadians have told this story for so long that they mayactually begin to believe it, and so it is possible that she believes it--but I don't and so, to me, on this alone her credibility grade goes to zero. As for theological orthodoxy in caring for the down trodden, the book (I assume unintentionally, and out of ignorance) comes up woefully short as well.The authors seem content to relegate much of the world to perpetual poverty and misery for such is the inevitable result of the "solutions" of the environmental movement that they espouse.Likewise, they have no problem with the inherently racist policies of the movement pertaining to oil drilling--it's fine where the brown peoples live, but not good for the USA, page 153.Not very Christian. I consider myself an avid environmentalist. I start with picking up the trash along our road. I would do many things differently if I held the power but they would be done with eyes open and with demand of integrity in the scientific community, and I would not play upon the goodwill of my Christian brethren. All in all, I cringe at the thought that many church libraries will perpetuate this work that I think should be relegated to the ash heap. I've been interested in the climate change argument I've been digesting both sides of the debate for quite some time, and the authors provide a fresh perspective in this work. While a faith-based perspective is at the forefront of the book, it is really based on solid logic and scientific arguments that transcend much of the mainstream news. I believe it is a must-read for anyone wanting to see evidence of climate change from a balanced perspective. 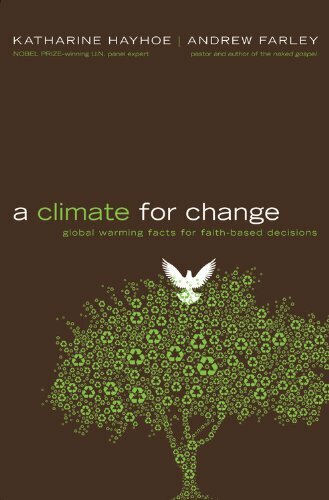 A Climate for Change is a clearly written, engaging read, with a straightforward presentation of the facts behind today's concerns about global warming and the "positive feedback loops" that are exacerbating the effects of human actions.Written from the perspective of thoughtful Christians, the book challenges all to reflect on what would be loving Christian responses to the impacts of global warming, which will fall most heavily on those least able to move or adapt to its changes.The science data presented is very clear.There are colorful inserts that clearly depict the changing trends the world is experiencing.While respectful of the different responses that people of conviction may make, the authors suggest that, individually, we each will make choices, and those choices will have consequences.They encourage truly keeping God at our center, and choosing to do that which will honor God and best respect God's handiwork. "A timely, objective, and informative analysis of the financial opportunities and challenges presented by climate change, including a thorough description of adaptive measures and insurance products for managing risk in a carbon constrained economy." "Climate change will have enormous financial implications in the years to come. How businesses and investors respond to the risks and opportunities from this issue will have an enormous rippling effect in the global economy. Sonia Labatt and Rodney White's insights and thoughtful analysis should be read by all who want to successfully navigate this global business issue." "In Carbon Finance, Labatt and White present a clear and accessible description of the climate change debate and the carbon market that is developing. Climate change is becoming an important factor for many financial sector participants. The authors illustrate how challenges and opportunities will arise within the carbon market for banking, insurance, and investment activities as well as for the regulated and energy sector of the economy." —Charles E. Kennedy, Director and Portfolio Manager, MacDougall, MacDougall & MacTier Inc.
"Climate change is the greatest environmental challenge of our generation. Its impact on the energy sector has implications for productivity and competitiveness. At the same time, environmental risk has emerged as a major challenge for corporations in the age of full disclosure. Carbon Finance explains how these disparate forces have spawned a range of financial products designed to help manage the inherent risk. It is necessary reading for corporate executives facing challenges that are unique in their business experience." "In this timely publication, Labatt and White succeed in communicating the workings of carbon markets, providing simple examples and invaluable context to the new and changing mechanisms that underpin our transformation to a carbon-constrained world. Carbon Finance will be the definitive guide to this field for years to come." Muy buen libro, vale la pena leerlo aunque recomiendo para los principiantes comenzar con uno más sencillo. Worth every penny!!! !..Great source for understanding market dynamics. Really enjoyed the book. Was interesting, well composed, and was a useful source in gaining a comprehensive understanding of complex environmental finance mechanisms. I would definitely recommend it !!!! Good introduction book, nothing contained about finance. This is a good book if you want to have an overall picture on the Carbon markets. The book provides summary of how the carbon markets were formed, why and how. However, do not expect to find any finance related chapters in the book, such as an in depth description of how instruments are structured, or on how to implement carbon instruments in actual projects. However, this book is excellent as an introduction, and is a must read before going on to more complicated text. 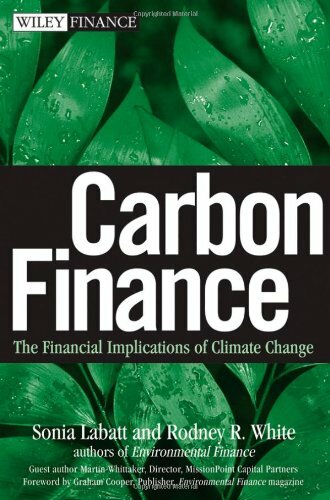 My only problem with the book was its title, which gave me the impression that the book will be much more concentrated on the "financial" part of carbon trading. The book is an acknowledgement of how environmental concerns, and specifically global warming, are approaching mainstream. Labatt and White give a sober summary of various types of energy sources, nonrenewable and renewable. With the pros and cons of each. Aside from these energy sources, they also discuss how to perhaps sequester carbon. That is, remove what is usually carbon dioxide emissions from the environment. One promising idea is to inject it into deep oil and gas fields. In part, this is helped by the fact that it is already being done. Albeit to improve extraction of the oil and gas. The text also explains how aviation is a huge source of CO2 emissions. Something not originally considered significant, just a few years ago. The book also goes into ways to do emissions trading. Big problems still exist, including verification of emissions. There is no mention of some pioneering work in the early 90s in Southern California, with the Air Quality Management District, and an exchange called Buenos Aires [sic]. Ludicrous right wing baloney. There have now been thousands of peer-reviewed professional papers published by seasoned relevant researchers demonstrating, not only historically out of bounds global climate CHANGE (not all of it will be warming), but statistically driven proof of human causality. How many peer reviewed studies have been published demonstrating a LACK of human causality? Anyone? Oh, that's right. It is zero, zip, nada. Right wingers lie about climate change but scientists go by the results, even if they contradict their possible pre-existing beliefs. I have seen quite a few professionals who have abandoned their prior skepticism about climate CHANGE (not all of it will be warming). Why is the British government leading the global effort to deal with the issue. Because they are scared spitless by the increasingly rapid loss of the Greenland icecap. NASA satellite measurements have recently shown that the loss rate has been twice that predicted only about 5 years ago. This leads to a great increase in 'bergs' being calved off of the edge of the icecap. These bergs float out into the northern Atlantic and slowly melt when they get in the warm current coming across from the Gulf. This influx of cold fresh water decreases the salinity of the so-called 'Atlantic conveyor' which carries heat from the warmer southern waters up to the area of the British Isles. The heat is released there, often in the form of warm precipitation, and the cooler resulting water sinks to the bottom due to its high salinity and flows back towards the south. Seabed deposits show that the Atlantic conveyor has totally stopped several times (at least) in the last 100,000 years. That is very much not a good thing. The loss of the added heat from the Atlantic conveyer basically makes the British Isles and much of western Europe almost uninhabitable and destroys any form of agriculture. Only the most incompetent leader would stand back and watch that sad fate developing without taking immediate strong action. I firmly believe that Tony Blair tried to maintain close ties with the current administration to get more influence over U.S. climate change policy. It remains to be seen whether that worked. And, yes, there have been numerous warming and cooling periods on Earth historically. Primarily driven by the increasing well understood Milankovitch cycles. The cycles run the earth's climate system with a little help (!) from the sun. The statistical variance in a cycle comes from other influences including human intervention. In my effort to learn about climate change, I found it admittedly very difficult to read the lengthy IPCC reports (e.g. 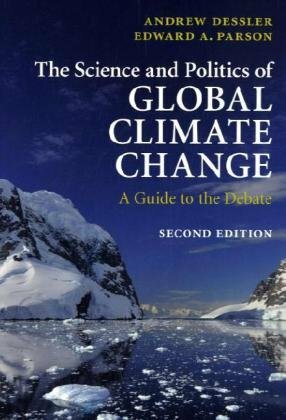 Climate Change 2007: The Physical Science Basis), so it's wonderful to have Dessler's and Parson's short, inexpensive book to give a guide to the findings of the IPCC, as well as to explain some of the politics in a calm, rational way. I think that any citizen genuinely interested in this topic should try to become familiar with the actual IPCC findings. What is the IPCC ?What have they concluded ?How uncertain are the conclusions ?How have the policy makers reacted ?What are the scientific criticisms ?These issues are explained in this nice compact book.A very good aspect of this book is that it conforms to the standard practice of scientific argument: it shows data, describes theories (models), discusses how the theory fits data, explains the uncertainties, and (importantly) cites references.When looking into this subject, I suggest the reader beware of books or articles that are primarily "expert opinion" with no, or very little, reference to actual data. The only reasons I didn't give 5 stars are: a) I would have liked it if the book could have covered the 2007 edition of IPCC report (maybe they will update it ? ), and b) The book has a somewhat dry, academic style which probably will not make it very popular with a mass audience, hence limiting it's impact.At least it's short, though. Perhaps when they update it they can bring in a science writer to improve the style. It's a very good synoptic overwiev of almost all aspects regrding this complex and actual argument. It's a very good link between too mathematical reading of many scientific papers and oversimplified divulgative texts. maybe, a short paragraph on solutions of CO2 in the oceans would be interesting. Other aspects which would be linkable to all of these could be, for instance, the immission of water vapour in the troposphere due to combustion, and if changes in Earth's angular momentum due to fuel extraction can lead to any change in climate stability. Many professional scientists need to rapidly access key information on specific aspects of a new domain of science they are vaguely familiar with. For me climate change falls in this category. I came across some very positive comments on this book and decided to make it my first introduction to the topic. I was particularly interested in measurements of climate change and broad descriptions of associated mathematics to guide me on planning the first steps on some work in that domain. I found chapters 4 and 5 particularly useful for that purpose. They provide appropriate qualitative descriptions of what I may need to look for in scientific papers to get me started on the development of some local empirical models.I found general discussions on the ENSO and other climatologic measurements of interactions between oceans and atmosphere pitched just at the right level. I will have no hesitation to recommend this text. After reading some other text introducing the general topic of climate change, the next step should be this book. Burroughs does an excellent job of introducing the intermediate level to the concerned citizen. It is an unbiased account of the state of knowledge and covers a broad spectrum of climate change from statistical interpretation to continental drift. 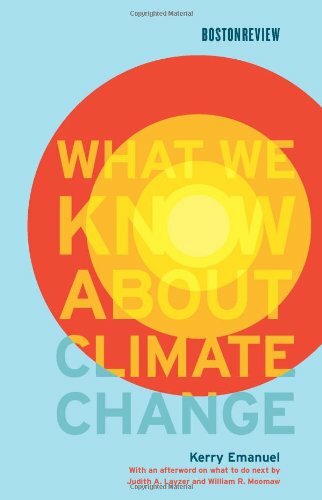 This is not a book for people that want to confirm alarmist or denialist positions, but a methodical (sometimes dry) walkthrough of the topic of climate change that require at least fundamental knowledge of natural science. Be prepared to do your homework though. Roughly a billion people around the world continue to live in state of chronic hunger and food insecurity. Unfortunately, efforts to improve their livelihoods must now unfold in the context of a rapidly changing climate, in which warming temperatures and changing rainfall regimes could threaten the basic productivity of the agricultural systems on which most of the world’s poor directly depend. But whether climate change represents a minor impediment or an existential threat to development is an area of substantial controversy, with different conclusions wrought from different methodologies and based on different data. 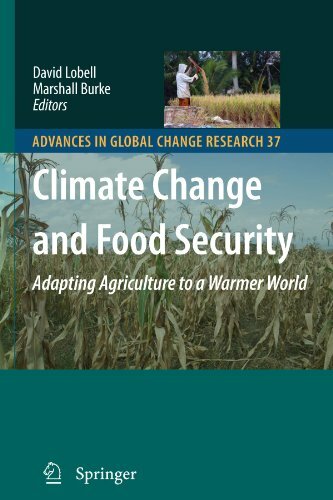 This book aims to resolve some of the controversy by exploring and comparing the different methodologies and data that scientists use to understand climate’s effects on food security. In explains the nature of the climate threat, the ways in which crops and farmers might respond, and the potential role for public and private investment to help agriculture adapt to a warmer world. This broader understanding should prove useful to both scientists charged with quantifying climate threats, and policy-makers responsible for crucial decisions about how to respond. The book is especially suitable as a companion to an interdisciplinary undergraduate or graduate level class. Climate change is now upon us. While mitigation is essential to reduce the future severity of climate change, it will take time and some effects will inevitably continue for centuries. Consequently, more attention is now also being directed to adaptation as a means of reducing losses. As the importance of adaptation becomes more apparent, there is need for wider appreciation and understanding of the concept and its potential as well as the obstacles to its effective deployment. 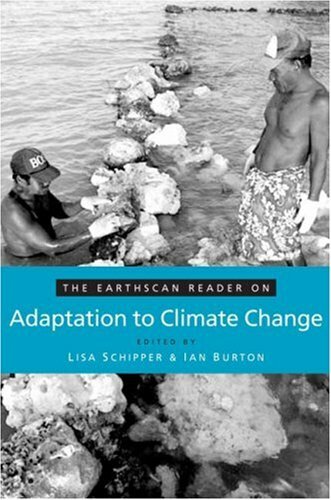 This reader, the first of its kind, pulls together and makes sense of the most significant writings on adaptation to climate change from the past two decades. An introduction maps out the field and traces the evolution of adaptation from a biological concept into a policy objective. The literature is divided into five sections. Part I: Adaptation Science includes papers that have been seminal in evolving the conceptual thinking about adaptation and tackles the complexities of adaptation typology and other conceptual issues. Part II: Adaptation, Coping and Resilience covers the specifics of what adaptation is and includes papers that feature case studies and examples of adaptation, discusses constraints to adaptation and examine adaptation vis-à-vis coping and resilience. Part III: Adaptation, Risk and Vulnerability includes papers that discuss the specific role that adaptation plays in reducing vulnerability to climate change and disaster risk and specifically the relationship between adaptation and risk management. Part IV: Adaptation and Development covers the relationship between future development and immense challenges posed by the needs of adaptation in a variety of contexts.Part V: Adaptation and Climate Change Policy presents material that discusses adaptation within the UNFCCC and also other policy mechanisms, such as insurance and legal issues arising from adaptation. 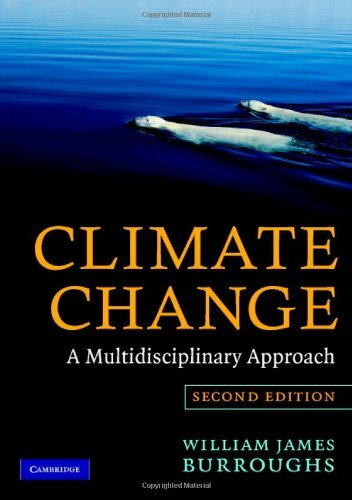 This is the ideal collection for students, policy makers, researchers, activists and NGOs and all people who need a solid grounding in all aspects of climate change adaptation. The issue of global climate change has risen to the top of the international political agenda. Despite ongoing contestation about the science informing policy, the economic costs of action and the allocation of responsibility for addressing the issue within and between nations, it is clear that climate change will continue to be one of the most pressing and challenging issues facing humanity for many years to come. includes multiple examples from both the north and the global south. 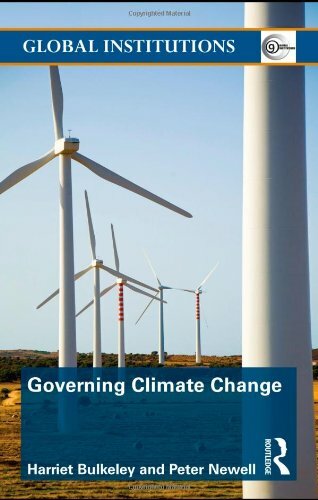 Providing an inter-disciplinary perspective drawing on geography, politics, international relations and development studies, this book is essential reading for all those concerned not only with the climate governance but with the future of the environment in general. Very good overview-level synopsis of the legal landscape as it shapes regulation of greenhouse gases in the U.S.Unfortunately, it was published just before the 2007 Massachusetts decision, so it does not address these implications directly. The premises of this volume rest upon the intellectual and scientific quicksand which underlies the entire phenomenon of "global warming" hysteria. Like the vast majority of those who have jumped onto the "global warming" bandwagon, the editor and contributors to this volume bring no scientific expertise to the project, being content to blindly accept the extreme hypotheses of some scientists on the federal grant gravy train and run with them. But this will make little difference to those lawyers who are looking for new avenues in which to peddle their "services," just as they sign up for the latest specialized conferences on Vioxx litigation and the like. Cap and trade, however, will provide a virtual goldmine to litigation-happy lawyers for years to come as it drives a stake into the heart of the American economy. It will, in its dire effects, constitute the most far-reaching, and totally unecessary, case of economic masochism in American history. Nevertheless, it's astounding what a negligible increase of 0.8 degrees Celsius in the world's temperature over the past 150 years, coming at the end of the Little Ice Age, will do to fuel the collective, and collectivist, mindset among the nations and citizens of the world.These temperatures have variously risen and fallen for eons. Indeed, some of the most highly qualified climate scientists have painstakingly documented the existence of a 1,500-year climate cycle over the entire globe. In a monumental 1983 study of mile deep Greenland ice core samples by Denmark's Willi Dansgaard and Switzerland's Hans Oeschger (results confirmed a few years later on Antarctica, and by scores of proxy studies) revealed a 250,000-year world climate history which reflected the moderate climate cycles of the sun.What characterizes the present era, however, is a lot of bad science anxious to tap unlimited sources of government funding for climate research, a gullible media, quasi-religious environmental organizations, and the nefarious influence of politics upon the scientific enterprise. The fruits of that "research" include Michael Mann's now thoroughly debunked "hockey stick" representation of the most recent 1,000 years of climate history, which, nevertheless, became a prominent feature of Al Gore's global warming sideshow, and which finds naïve acceptance by the editor of this volume (see Figure 1-1). The "presentist" mindset, which interprets the current climate experience as a unique and threatening phenomenon, reveals a sorry lack of historical perspective. Most significantly, the carefully documented climate record reveals that temperatures were 2-4 degrees higher in the medieval warm period (900-1300 A.D.) than they are today, when CO2 levels are higher, and that CO2 levels are actually an 800-year lagging indicator of global warming, not a causal factor.Many of the scientists who contributed to the 1996 Intergovernmental Panel on Climate Change (IPCC) documented these findings, concluding that no such "human fingerprint" had been found in the recent global warming, but their statements were shockingly removed from Chapter 8 of the IPCC's 1996 report by U.N. bureaucrats and U.S. politicians in the Clinton administration anxious to manufacture "consensus" regarding anthropogenic global warming.This is the context in which books like the Global Climate Change and U.S. Law are produced.Regardless of the flawed presentation of the science presented in this volume, however, lawyers stand to make a good living off the complex legal and regulatory schemes detailed in this book, including the implementation of an elaborate system of emission cap and trade programs, as well as the more benign efforts to conserve energy, and develop renewable energy sources. 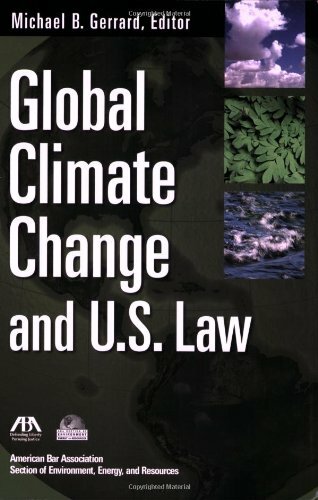 Building upon this flawed scientific analysis, Part I of this volume describes the national and international framework of climate change regulation, the impact of the Kyoto Protocol on U.S. business, clean air regulation, civil remedies, climate change in facility permitting, and international trade and development. Part II describes the emerging regional, state and local actions, together with a 50-state survey of state responses to climate change. Part III examines a variety of corporate actions, including disclosure issues, fiduciary duties, insurance and climate change, and subsidies, tax policy and technological innovations. Part IV examines the legal aspects of efforts to reduce greenhouse gases, such as voluntary efforts, emissions trading, and carbon sequestration. It also includes a list of important resources, a glossary of climate-related terms, a list of acronyms; endnotes, and index. Twenty-four authors contributed to this volume under the editorship of Michael Garrard, a partner in the New York office of Arnold & Porter LLP, where he heads its environmental practice group. The views of the individual authors stand alone, irrespective of the views of the other contributors. For more authoritative and balanced views of the science of global climate, see Fred Singer and Dennis Avery's Unstoppable Global Warming: Every 1,500 Years (Rowman & Littlefield, 2007); Lawrence Solomon's "The Deniers" (Richard Vigilante Books, 2008);" Iain Murray's "The Really Inconvenient Truths" (Regnery, 2008); Roy Spencer's "Climate Confusion" (Encounter Books, 2008); and Henrik Svensmark and Nigel Calder's The Chilling Stars: A New Theory of Climate Change (Icon Books, 2007), which argues that the interplay of clouds, the sun, and cosmic rays has a far more profound effect of climate than carbon dioxide.Readers are also directed to Willie Soon and Sallie Baliunas' metanalysis of studies related to the existence of the climate cycle, the Medieval Warming Period, and Little Ice Age (see "Reconstructing Climatic and EnvironmentalChanges of the Past 1000 Years: A Reappraisal," Energy and Environment 14, no. 2/3 (March 2003), 233-296.They discovered 112 studies about the Medieval Warming Period, 92% of which showed evidence of warming, 124 studies from around the world addressing the existence of the Little Ice Age, 98% of these confirming the era's cooling.Finally, they examined 102 studies containing information on the question of whether the 20th century was the warmest on record, 78% of which found earlier periods lasting at least 50 years that were warmer than any period in the 20th century. Ironically, despite all the hoopla about "global warming" or, as it isincreasingly called as temperatures have fallen, "climate change," global mean temperatures are now at roughly their 3,000-year average. The EPA, led by Lisa Jackson and its socialist "global warming" czarina Carol Browner,has now declared carbon dioxide to be a "pollutant. "This is surely the most scientifically unfounded decision and the most damaging to our economy and freedom in the history of that agency. And, if implemented, it will rank with the banning of DDT as the most deadly action every perpertated by the U.S. government on the world's poor.But that won't stand in the way of thousands of lawyers trying to make a buck off their, and our, misery. This is the most comprehensive and current reference resource on climate change available today. It features 49 individual chapters by some of the world’s leading climate scientists. Its five sections address climate change in five dimensions: ecological impacts; policy analysis; international considerations; United States considerations; and mitigation options to reduce carbon emissions. In many ways, this volume supersedes the Fourth Assessment Report of the Intergovernmental Panel on Climate Change (IPCC). Many important developments too recent to be treated by the 2007 IPCC documents are covered here. This book considers not only the IPCC report, but also results of the UN Framework Convention on Climate Change held in Bali in December 2007, as well as even more recent research data. Overall, Climate Change Science and Policy paints a direr picture of the effects of climate change than do the IPCC reports. It reveals that climate change has progressed faster than the IPCC reports anticipated and that the outlook for the future is bleaker than the IPCC reported. In his prologue, John P. Holdren writes that the widely-used term global warming” is a misnomer. He suggests that a more accurate label would be global climatic disruption.” This volume, he states, will equip readers with all they need to know to rebut the misrepresentations being propagated by climate-change skeptics.” No one, he writes, will be a skeptic after reading this book. Climate scientist Stephen H. Schneider (who died in July, 2010) here organizes 49 essays from noted experts to explore the state-of-our-knowledge of "global climatic disruption" and potential related policy initiatives. The essays are scholarly and, in some cases, quite technical, with charts, maps, and detailed sourcing. There are five main sections. "Impacts of Climate Change" ranges over extinction, ecosystems, water, hurricanes, wildfires, forests of Amazonia, crop production and food security, human health, and unique and valued places. "Policy Analysis" looks at economic impacts, assessment modeling, risk perceptions, political feasibility, carbon taxes/trading/offsets, and the economic cost of reducing COs emissions. "International Considerations" include treaties, EU climate policy, population, inequities and imbalances, ethics and rights, developing countries, the Clean Development Mechanism, and climate change and policy in China, India and Australia. There is a large section (9 essays) on the United States, including an interesting look at California's approach to combating climate change and at the role of media and public education in shaping policy. The fifth section, "Mitigation Options to Reduce Carbon Emissions", discusses renewable energy, hydrogen and nuclear energy, coal capture and storage, "avoided deforestation" policy for tropical forests, and the pros and cons of engineering the climate. The information presented here, current to late 2009, is quite alarming, even for someone who has been following climate change for some years. I guess someone has to make an effort to pull things together and hope to change the future, but the more I read in this field, the less hope I have that we as a species can cooperate in time and to the extent necessary to avoid changes for which we aren't prepared and wouldn't want if they were to happen today. In addition to the fact that the many, many consequences of climate change are endlessly layered and interconnected, they are also global, the scope of which most people don't fathom. We aren't talking about simple temperature warming, but massive changes in food production and water availability, location of growing seasons, food chain extinctions, and unprecedented illness and death from starvation, lack of drinking water, and political unrest as huge populations can no longer survive within their countries' borders. It doesn't help that industrial countries have the most to lose in lifestyle but the least in safety, at least for the next few decades. It is also possible that some wealthier countries will see short-term benefits from climate change, which will add to the unwillingness to alter our ways. However, the lag time in climate change is several human lifetimes, and it is too easy to indulge our species' short attention span and need to fulfill immediate wants. Add to that the political improbability of international trust and cooperation for what is needed to stop catastrophe, and the future seems quite bleak. While this book is difficult for the non-specialist to read, it is full of data and the scientific proofs rarely found in more popular books on the topic. This is the book to read to find out exactly why most scientists are extremely concerned and some terrified by what we've set in motion. Most of the writers make an attempt to just present the facts without sounding an alarm, and the effect is perhaps more disturbing: the bald facts lay out a future we really, really don't want but seem incapable of fully grasping. And therein may lie our fate. Climate issues are where science and politics often clash because of the conflict between objective science and subjective corporate interests, between concerns for the long term conditions of the earth and the short term advantages of electoral profits and corporate vested interests with respect to the specific phenomena of global climate change. That's why it is so important for not only the scientific community but the non-specialist general reader that titles like "Climate Change Science and Policy", the collaborative work of Stephen H. Schneider (Melvin and Joan Lane Professor for Interdisciplinary Environmental Studies, Professor of Biology, and a Senior Fellow, Woods Institute for the Environment, at Stanford University); Armin Rosencranz (Founder and Former president of Pacific ; Michael D. Mastrandrea (Consulting Assistant Professor, Woods Institute for the Environment, Stanford University); and Kristin Kuntz-Duriseti (Managing Editor, 'Climatic Change') addresses not only the science behind what is more accurately described in its pages as the global climate change which is now in progress, but the national and international governmental policy implications as well. Of special note is the introduction to this informed and informative 544-page compendium by John P. Holdren (Director of the White House Office of Science and Technology Policy). 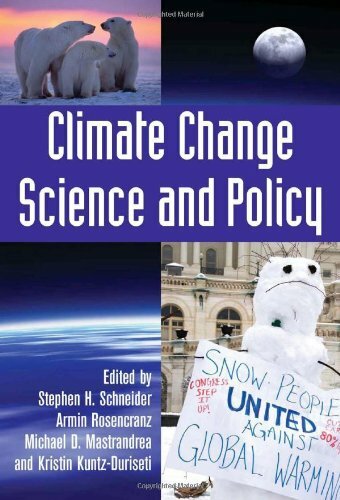 Superbly organized and presented, "Climate Change Science and Policy" is a seminal body of work and a strongly endorsed addition for academic, governmental, and community library Environmental Studies reference collections, and supplemental reading lists for non-specialist general readers concerned about environmental issues in general, and climate change in particular.